Huntington officials say they’re using layoffs and cuts to cut the city’s projected $4.8 million budget deficit in half. Huntington’s mayor says he doesn’t anticipate any more cuts to the city’s staff as he looks to close the rest of the fiscal gap. 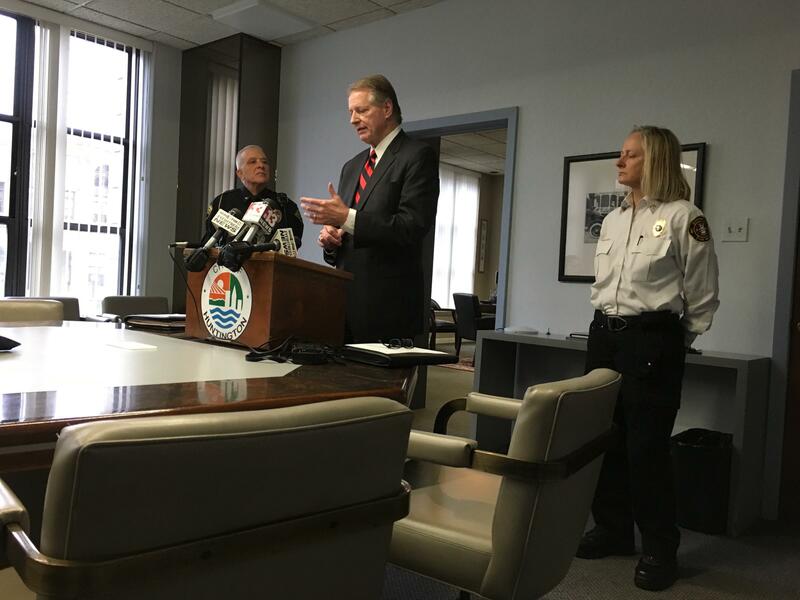 Huntington Mayor Steve Williams was joined Thursday at press conference about budget cuts, by Police Chief Joe Ciccarelli (left) and Interim Fire Chief Jan Rader (right). Huntington Mayor Steve Williams has authorized cuts to the city budget that range from changes in health insurance, to instituting a hiring freeze, to making cuts to the police and fire departments. Those cuts include the dismissal of 24 of the city’s 355 employees. Six civilians were let go in the police department, including record clerks, an administrative assistant, an IT technician and a fleet coordinator. One temporary police officer was let go, an officer who fills in for others when they’re on military duty, and 10 recently hired probationary officers that were either still being trained or are going through the police academy. On the fire department side, seven recently hired probationary firefighters were let go as well. Williams said this is just the beginning of the process. "What we’re doing today is just the first step, it’s a surgical operation," Williams said. "And what we’re hoping is the results of what we’re doing today will put us in a position where we don’t have to come back to make any further adjustments." Williams said he still needs to work on finding ways to reduce the $2.2 million deficit the city still faces, but he doesn’t expect any more personnel cuts. He also said they could take some of that debt into the next fiscal year. Huntington Police Chief Joe Ciccarelli said the cuts shouldn’t affect public safety. "We’re going to backfill the positions in patrol bureau, so that our patrol forces are fully staffed as they are today," Ciccarelli said. "We will see, because we’re going to pull officers from other assignments, we will see reductions in the special investigations bureau and the criminal investigations bureau, but we’ll attempt to maintain as much as we can the level of service that we have been providing." Brian Lucas is the President Fraternal Order of Police, Gold Star 65 -- the union that represents Huntington’s police department. Lucas said he hopes there are no more cuts after today, but said he’s not sure he can believe the mayor. "The Mayor sat up in council and said he was exploring every option of not cutting jobs and 24 are gone," Lucas said. "I have absolutely zero faith in anything he says about not cutting jobs at this point. If he proves me otherwise, I’ll be the first to come here and give him his props, until then I believe nothing he says about not cutting jobs." The cuts announced Thursday are effective immediately. 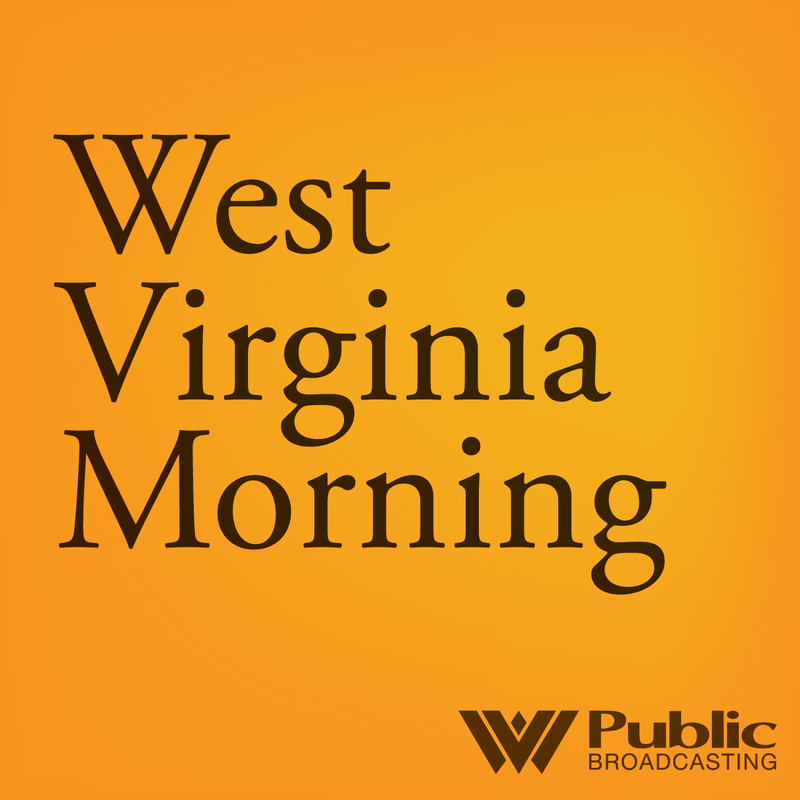 On West Virginia Morning, part two of a report about the use of antibiotics in animals and concern about drug resistant bacteria and Appalachia Health News reporter Kara Lofton talks with three West Virginians about their healthcare if the Affordable Care Act is repealed. The city of Huntington is dealing with budget issues that have the police and fire departments on a pace to exceed their budget for the fiscal year. 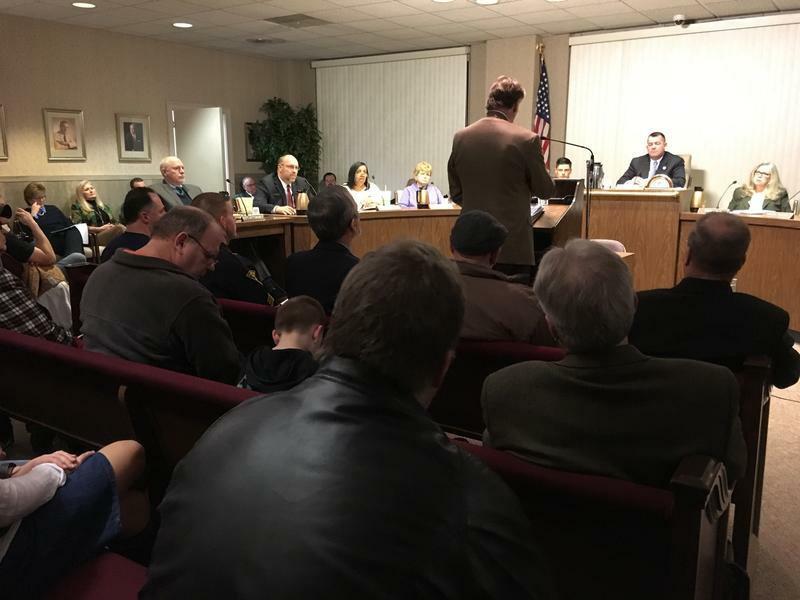 At a city council meeting Monday night, Huntington Mayor Steve Williams updated council members on the additional cuts he's asked the two departments to make in order to assure the city can balance its budget this year. Despite the deficit, Williams and city counselors are cautiously optimistic that a budget without police or fire layoffs can occur. Huntington Mayor Steve Williams says the city's budgetary problems are rooted in three areas. The first, police and fire departments have outspent their annual budgets with six months left in the fiscal year. Along with the overspending, health insurance costs for the city have steadily increased as well as the amount Huntington is paying into its police and fire pension funds. When you combine all three, Huntington is facing an approximate $4.8M budget deficit by the end of the fiscal year in July. 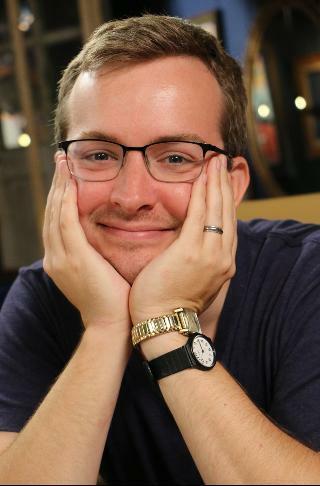 Marshall Graduate and Huntington Native Griffin McElroy has been named to Forbes 30 under 30 list for media for 2017. The 29-year-old McElroy was chosen for his work as the founding editor of Polygon, Vox’s video game website as well as weekly podcasts. Federal authorities say an Ohio man responsible for more than two dozen drug overdoses in Huntington, West Virginia, has pleaded guilty in federal court to distributing heroin. 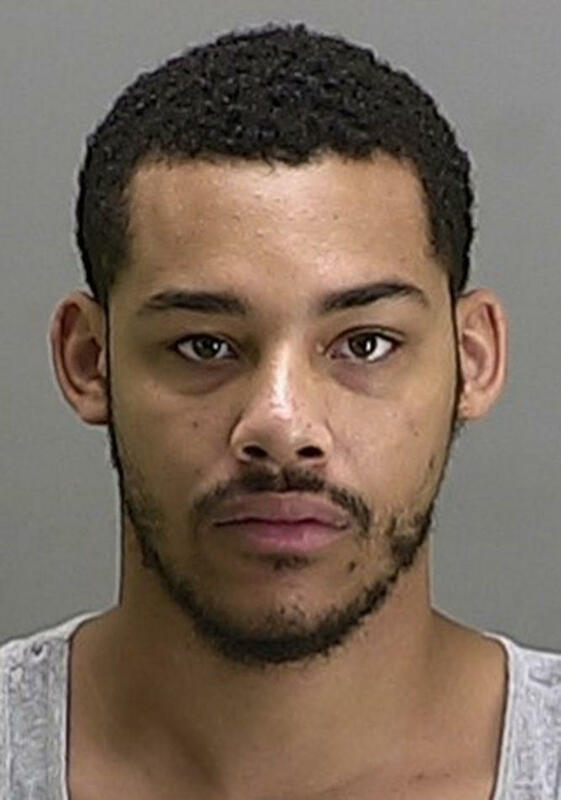 Authorities say 22-year-old Bruce Lamar Griggs of Akron, also known as "Benz," faces up to 20 years in prison at sentencing April 10. The current President of the Kentucky Coal Association is leaving the energy industry, for a job back in his hometown of Huntington. 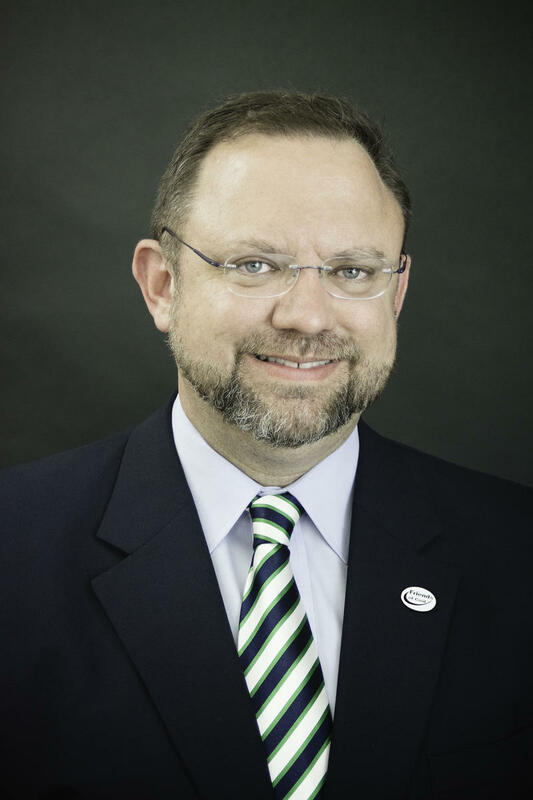 Bill Bissett will be the next President and CEO of the Huntington Regional Chamber of Commerce starting November 1st. The 50-year-old father of two decided being in his home state and hometown was more important than leading the coal association in Kentucky.